Carroll/Fletcher is currently presenting Thomson & Craighead in ‘Party Booby Trap’, the art duo’s second exhibition with the gallery, filling the space with a plethora of 21st century post-millennial fears. The show even includes the artists first fragrance ‘Apocalypse’, 2016, not as unpleasant as the concept of this paranoia-inducing assault on the nervous would have you expect. The artists set the mood and start the party with ‘Untitled (Balloon work)’, 2016 – and the balloon bursts. 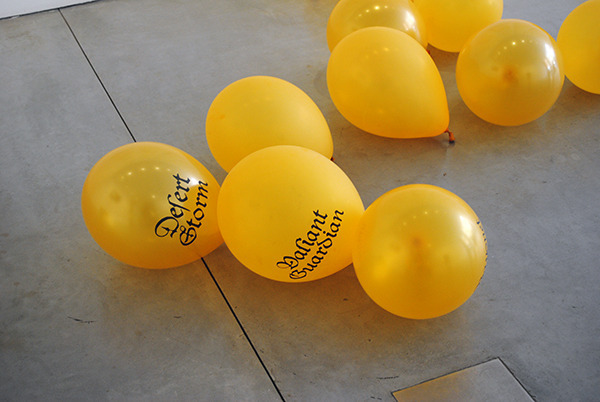 Multi-coloured balloons bearing the names of military operations from “Desert Storm” to “Urgent Fury” scatter the floor, and the party’s truly over. Walls covered in prints cheerily proclaim the date of the end of the world, as balloons are unceremoniously popped on a floor-based video work. Prepare yourself, the tone is set. Image: Thomson & Craighead, Untitled (Balloon work), 2016. Carroll/Fletcher. Photo: P A Black © 2016. The show is also a disturbing reflection of the passage of time: ‘Six Years of Mondays’ is a compilation of videos taken by a man in Fife of the weather outside of his bedroom window every morning, with each segment combining a whole year of Mondays. A progression of images, of ever-increasing ‘greyness’. The work is an expression of unrelenting temporal and existential depression. It would seem that as the viewer watches the weather, mad scientists are at work hell-bent on the manipulation of our very beings; ‘Stutterer’, 2014, a video installation that the artists describe as a “poetry machine”, focuses on the four types of DNA: adenine, cytosine, guanine, and thymine, commonly referred to as A, C, G, and T, running across a projected display as if an unending equation. Image: Thomson & Craighead, Stutterer (detail), 2014. Carroll/Fletcher. Photo: P A Black © 2016. 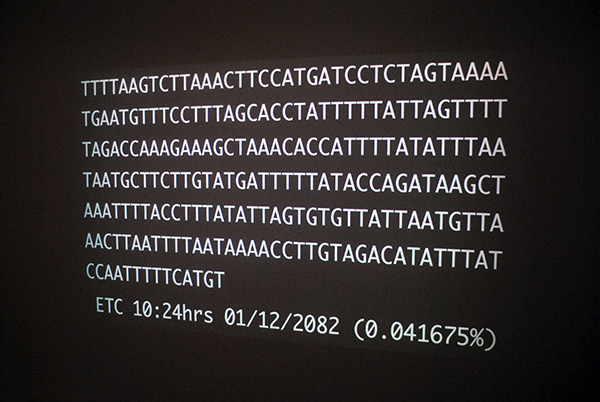 The work references the time it took to unlock the human genome: 13 years. This project began with the liberation of Nelson Mandela in 1990 and ended with the fall of Baghdad to the allied military coalition in 2003. ‘Stutterer’ pairs each projected letter with a word beginning with the same letter, spoken in apocalyptic television footage from the era. Our actions are re-writing our physicality and in turn our own realities. What would we look like now? It’s a harrowing consideration. ‘A Temporary Index’, 2016, presents a set of numbers that are presented vertically and doubled up forming visual abstractions. They are in fact the estimated ‘life’ of entombed radioactive waste, ranging from a few decades to a million years. Certainly a formerly powerful work; the piece sets a theatrical tone akin to a dystopia worthy of ‘Airstrip One’, with the ghostly presence of an Orwellian white-collar drone trapped in the relentless decryption of an endless set of totemic symbols. An impossible and pointless process imposed by the tyranny of some distant Ministry of Truth, on a life destined to remain processing the unfathomable information for its own sake. It was a relief to escape this powerful if rather traumatising exhibition, as I stumbled back onto Eastcastle Street in a paranoid haze and promptly turned my GPS to ‘OFF’. Thomson & Craighead have shown extensively at galleries, film festivals and for site-specific commissions in the UK and internationally. Solo shows include Maps DNA and Spam, Dundee Contemporary Arts, Dundee, UK (2014); Not Even the Sky, MEWO Kunsthalle, Memmingen, Germany; and Never Odd or Even, Carroll / Fletcher, London, UK (both 2013). Recent group exhibitions include Electronic Superhighway, Whitechapel Gallery, London, UK (2016); Big Bang Data, Somerset House, London, UK; Right Here, Right Now, The Lowry, Manchester, UK; Art In The Age Of…Asymmetrical Warfare, Witte de With, Rotterdam, Netherlands; How to Construct a Time Machine, MK Gallery, Milton Keynes, UK (all 2015) and the Nam June Paik Award, Haus Lange, Krefeld, Germany (2014). They live and work between London and the Scottish Highlands.